“It’s behind us,” Fernando Gonzales of the Cuban Five said with a smile when I told him just a few moments ago that I was sorry for the U.S. government having locked him in a cage for 15 years. It was nice of the New York Times to editorialize in favor of negotiations to release the remaining three, he said, especially since that paper had never reported on the story at all. Medea Benjamin recalled coming to Cuba back in an age when the United States was apparently trying to kill not only Cubans but also tourists who dared to come to Cuba. This, she said, is what the Cuban Five were trying to stop. So we’re glad, she told Gonzales, that we can come here now without worrying about Obama putting a bomb in the lobby. A crazy worry? It wasn’t always. Earlier today we visited the Latin American School of Medicine, which is now misnamed as it educates doctors from all over the world, not just Latin America. It began in 1998 by converting a former navy school into a medical school at which to give free education to students from Central America. 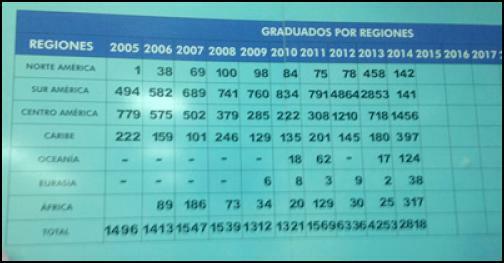 From 2005 to 2014, the school has seen 24,486 students graduate. Their education is totally free and begins with a 20-week course in the Spanish language. This is a world-standard medical school surrounded by palm trees and sports fields on the very edge of the Caribbean, and students who are qualified for pre-med school — which means two years of U.S. college — can come here and become doctors without paying a dime, and without going hundreds of thousands of dollars into debt. The students do not then have to practice medicine in Cuba or do anything for Cuba, but rather are expected to return to their own countries and practice medicine where it is most needed. Thus far 112 U.S. students have graduated, and 99 are currently enrolled. Some of them went with an aid “brigade” to Haiti. All of them, after graduating, have passed their U.S. exams back home. I spoke with Olive Albanese, a medical student from Madison, Wisconsin. I asked what she would do upon graduation. “We have a moral obligation,” she replied, “to work where it’s most needed.” She said she would go to a rural or Native American area that has no doctors and work there. She said that the U.S. government should be offering this same service to anyone who wants it, and that people who graduate with student debt will not serve those most in need. This morning we visited a still healthier place than the medical school: Alamar. 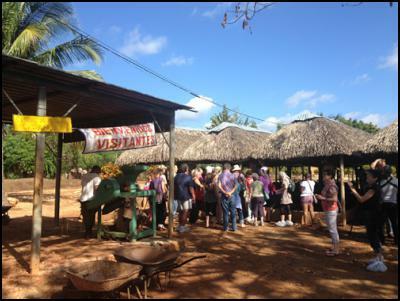 This organic farming cooperative on 25 acres east of Havana didn’t choose to go organic. Back in the 1990s, during the “special period” (meaning catastrophically bad period) nobody had fertilizer or other poisons. They couldn’t use them if they wanted to. Cuba lost 85% of its international trade when the Soviet Union broke up. So, Cubans learned to grow their own food, and learned to do so without chemicals, and learned to eat the things they grew. A meat-heavy diet began to incorporate a lot more vegetables. Miguel Salcines, a founder of Alamar, gave us a tour, with camera crews from German television and the Associated Press following. The farm has been featured in a U.S. documentary called The Power of Community, and Salcines has given a TED talk. To Cuba’s tradition of monocropping sugar, the USSR added chemicals and machinery, he said. The chemicals did damage. And the population was moving to cities. Big agriculture collapsed, and farming was transformed: smaller, more urban, and organic before anyone knew that name. People who resent the history of slavery and dislike the work of monocropping, he said, are now finding a better way of life working at organic farming coops. That includes 150 workers at Alamar, many of whom we observed and spoke with. Farm workers now include more women and more elderly Cubans. There are more elderly Cubans working on organic farms because Cubans are living longer (life expectancy of 79.9 years) and they are living longer, according to Salcines, at least in part because of organic food. Eliminating beef has improved Cubans’ health, he said. Biodiversity and beneficial insects and proper care for the soil replace fertilizers and pesticides, to everyone’s benefit. Thousands of minerals must be replaced in farmed soil, he said, and replacing just a few of them results in illnesses, diabetes, heart problems, and much else, including a lack of libido — not to mention more pests on the farm, which could be reduced by giving the plants proper nutrition. Even Cuba’s bees are reportedly alive and well. Salcines says Cuba produces 1,020,000 tons of organic vegetables per year, 400 tons of them at Alamar in great variety and at a rate of five crops per year. Alamar also produces 40 tons of worm compost per year, using 80 tons of organic matter to do so. Salcines pointed to Cuba’s healthy diet as something good that’s come of the U.S. embargo. On top of that scandalous remark he declared his disagreement with Karl Marx. Population growth is exponential and food production linear, he said. Marx believed science would solve this problem, and he was wrong, declared Salcines. When women are in power, said Salcines, the population doesn’t grow. So, put women in power, he concluded. The only way to feed the world, Salcines said, with an apology to Monsanto, is to reject the agriculture of killing in favor of an agriculture of life.